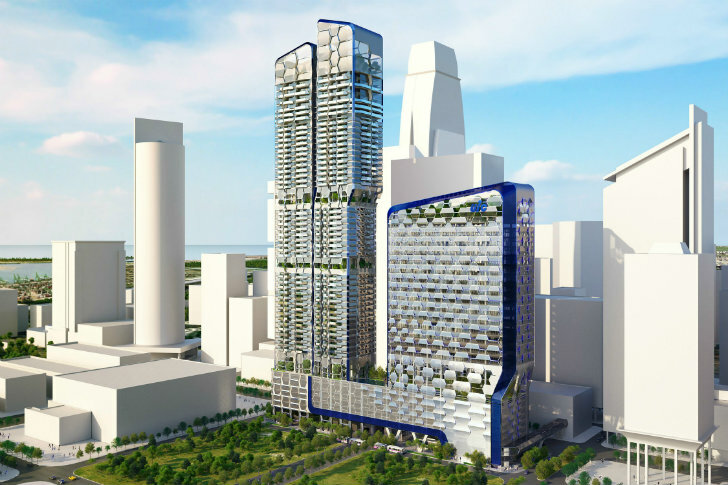 UNStudio just unveiled plans for a new dual-tower commercial and residential complex in Singapore called the V on Shenton, which will take the place of the UIC Building. 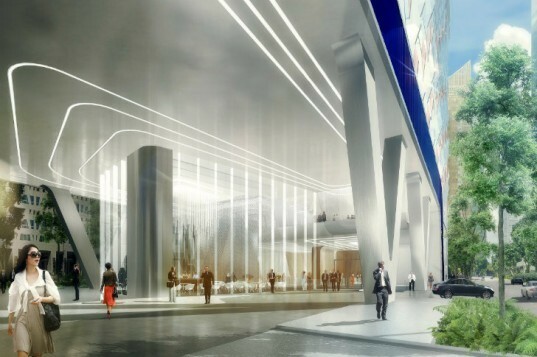 Located in the heart Singapore's Central Business District, the new UIC redevelopment will provide modern office and living space and feature the latest in energy efficient design. The high-performance facade is composed of hexagonal panels that create a hive-like pattern and work to minimize heat gain while providing an abundance of natural daylighting. Lush sky gardens will bisect the tower the three places and create a refuge from the city while cleaning the air. The V on Shenton (pronounced Five on Shenton) is part of a larger redevelopment of the CBD and will provide modern office and residential space in two towers. The 23-story office tower matches the scale of the surrounding buildings, while the 53-story residential tower distinguishes itself from the rest of the city. On the ground floor, a large lobby connects the towers with the streetscape and provides space for a lively reception area and a large cafe. The entire 8th floor is occupied by the first sky garden, which offers 360 views of the Singapore skyline and acts as a lush oasis for entertaining, recreation or rest. Two more sky gardens in the residential tower act as private parks for the residents and work to clean the air. The hexagon forms the basic modular shape of the facade and is repeated to create a hive-like pattern. The highly specialized design is integral to the performance of the building and relies on angles of the glass and shading devices. Shelves formed from the intersection of hexagons at the top and the bottom work to shade the interior and also to bounce light back into rooms. Angled and fritted glass panels optimize daylighting but not at the cost of solar heat gain. The overall effect provides for a highly efficient facade that transforms the towers into fascinating sculptures. Ben van Berkel said of the building, “The pattern of the façade comprises four to five different textures, each varying depending on the programme. At times the glass of the façade creates texture through the relief effect and the coloured side lighting, whilst the volumetric balconies of the residences create a deep texture in the total volume of the building.“ The project is expected to reach completion in 2016. The V on Shenton (pronounced Five on Shenton) is part of a larger redevelopment of the CBD and will provide modern office and residential space in two towers. The 23-story office tower matches the scale of the surrounding buildings, while the 53-story residential tower distinguishes itself from the rest of the city. On the ground floor, a large lobby connects the towers with the streetscape and provides space for a lively reception area and a large cafe. The entire 8th floor is occupied by the first sky garden, which offers 360 views of the Singapore skyline and acts as a lush oasis for entertaining, recreation or rest. Two more sky gardens in the residential tower act as private parks for the residents and work to clean the air. The hexagon forms the basic modular shape of the facade and is repeated to create a hive-like pattern. The highly specialized design is integral to the performance of the building and relies on angles of the glass and shading devices. Shelves formed from the intersection of hexagons at the top and the bottom work to shade the interior and also to bounce light back into rooms. Angled and fritted glass panels optimize daylighting but not at the cost of solar heat gain. The overall effect provides for a highly efficient facade that transforms the towers into fascinating sculptures. Ben van Berkel said of the building, “The pattern of the façade comprises four to five different textures, each varying depending on the programme."